From KLCC, drive into Jalan Ampang and moreover to Jalan Jelatek. You will pass Desa Tun Hussein Onn and DUKE Highway. You would then move into Section 10 Wangsa Maju. Head down to Jalan Wangsa Maju 12. You will see Wangsa Walk Mall on you right. The restaurant is just the opposite. 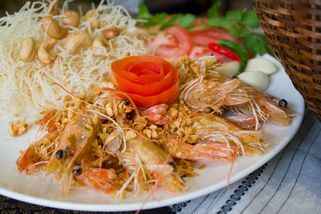 Ban Dot Mai is a Thai restaurant that prides itself on serving authentic Thai cuisine with a focus on fresh seafood. They manage to achieve this successfully courtesy of a chef brought in specially from Thailand. 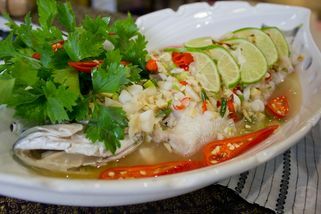 Signature dishes at the restaurant include Thai-Style Lemon Fish, Thai Papaya Salad with Chicken, and Garlic Shrimp. Vegetarian dishes are available too, as well as a buffet selection. 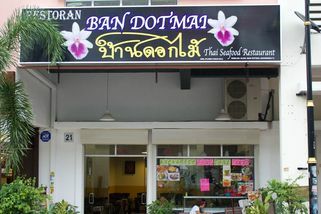 A high ceiling and two-tone walls, white above a sunny yellow, give Ban Dot Mai a sense of cheery spaciousness, while tastefully understated wall decorations and tablecloths made of Thai textiles add to the somewhat old-fashioned charm of Ban Dot Mai. "THE RESTAURANT IS CLOSED...!!! FRUS..."
This place is easy to miss if you don't pay enough attention. 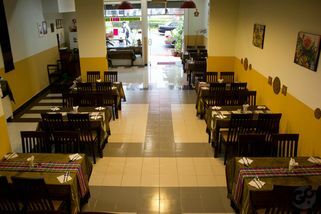 It's located in a busy area of Wangsa Maju, just opposite Wangsa Walk Mall. I first went in for lunch, just to give it a try. Tried their Pad Thai and boy was I impressed! Definitely one of the best I've had so far. Priced at only RM9.90, it's the cheapest too, compared to other local joints (normally they range between RM12.90-RM16.90 in other places). So I just had to go back for more. And I did. 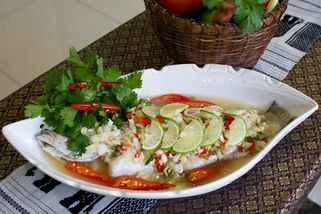 This time I had steamed fish and garlic prawns. Both were superb. Full of flavour, but not overpowering. Then I went back for more. Had the Sour Soup (same as Tom Yam), Fried Chicken with nuts, and Seafood Fried Rice. Very very satisfied. Since I've been here a few times, I've gotten to know the owner. 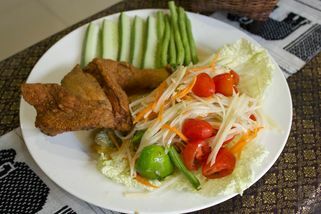 It's owned by Ms.Bubpha, a Thai national, who brings in trained Chefs from Thailand as well. No wonder they're able to maintain the authentic taste, unlike some other Thai restaurants that have adjusted their taste to Malaysian taste buds. Went there and tried their famous Thai-style Lemon Fish and Garlic Shrimp. The interior is so nice, very Thai-style. With Thai songs playing on the background, this place is great. Their staff are friendly, too. 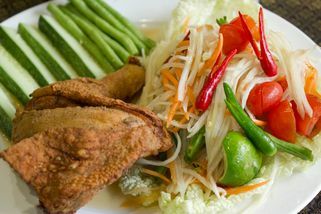 Thai food lover will definitely love this Restaurant!